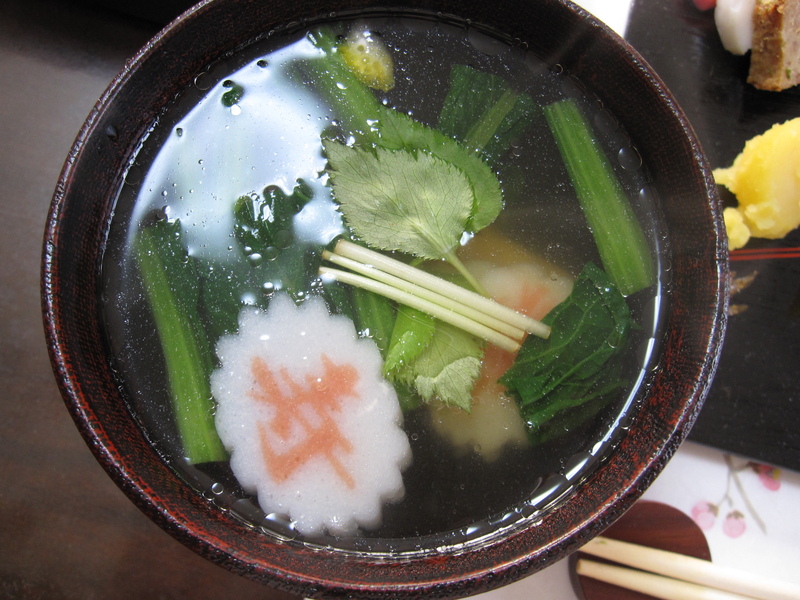 Oden is Japanese home cooking at it’s finest as well as being a favorite winter-time treat. 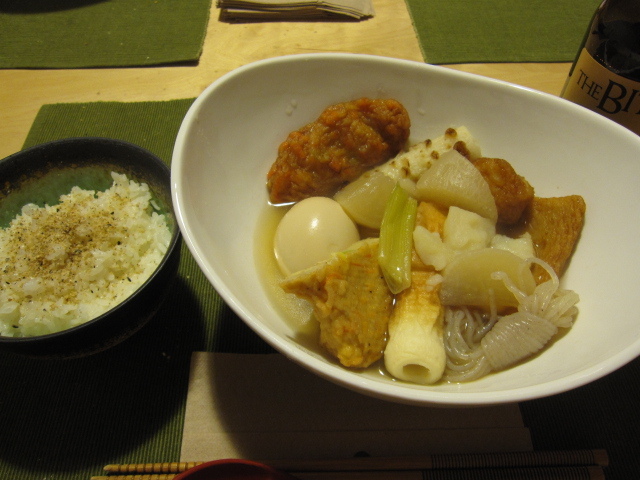 While the ingredients can vary, the basis of oden is to have a slightly salty dashi broth filled with fish cakes, daikon, konnyaku, hard-boiled eggs, and potatoes. Slowly simmered and warm in the belly, this is true comfort food. 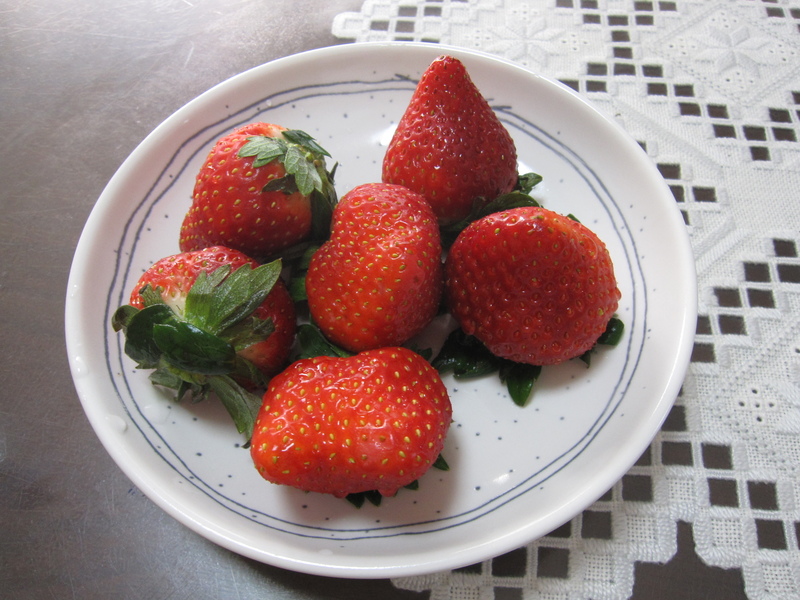 In Japan, it’s served at home, in restaurants, at street vendors, and you can even get it warm from vending machines (you can get anything in a Japanese vending machine, and I do mean anything!). 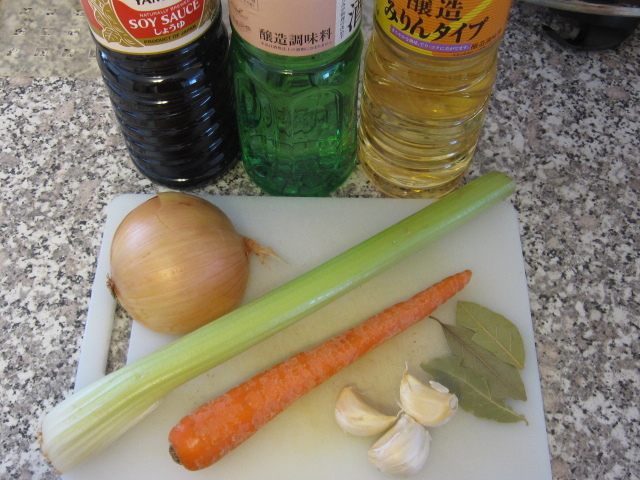 To start I made a good dashi broth. 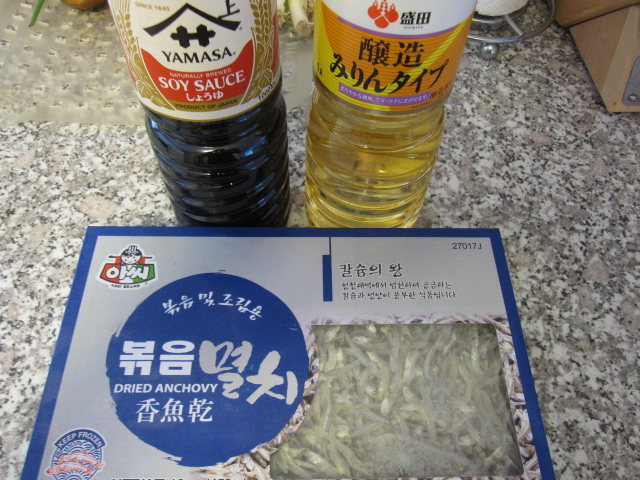 I used about 1/3 cup of dried anchovies, 3 tablespoons of mirin, 2 tablespoons of soy sauce, and 1 tablespoon of kosher salt. 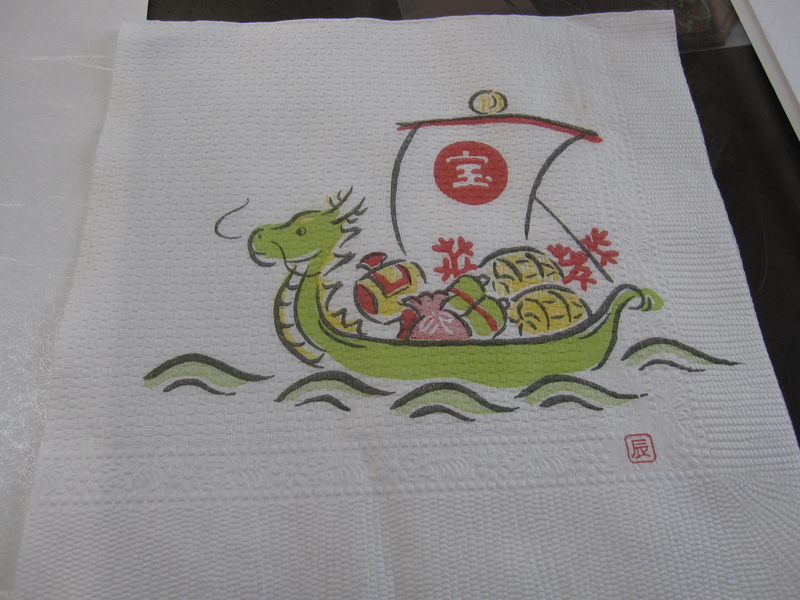 Most oden sets come with their own little packets of soy flavoring. They are usually pretty good, but it’s just as easy to do it yourself giving you more control over the flavor. 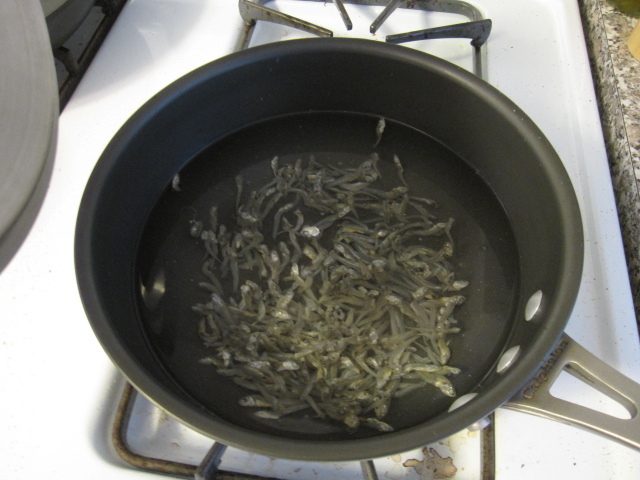 I let the anchovies simmer in 4 cups of boiling water for about an hour. I wanted every last bit of flavor out of the fish and into the broth. 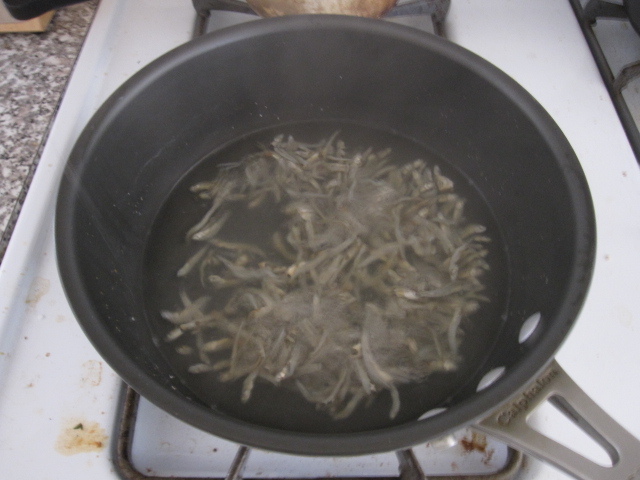 I strained the broth and discarded the anchovies. 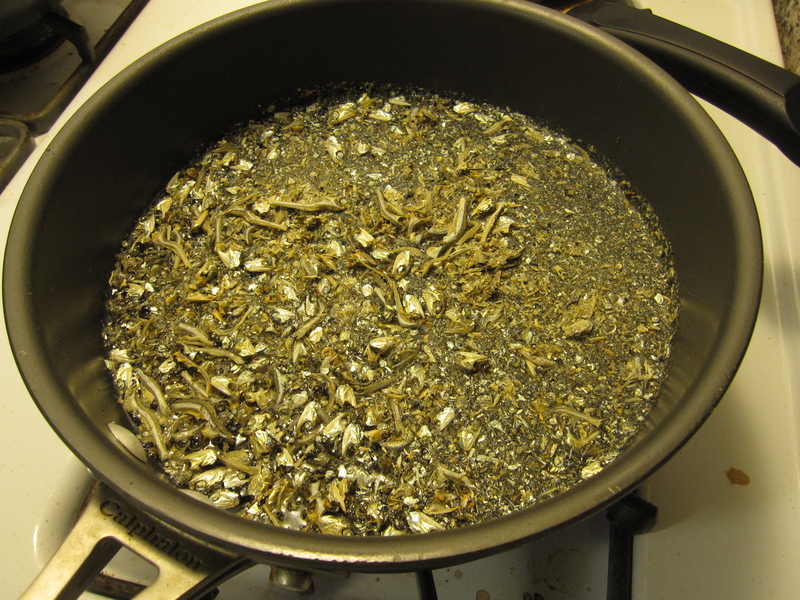 Then I mixed in the mirin, soy, and salt. 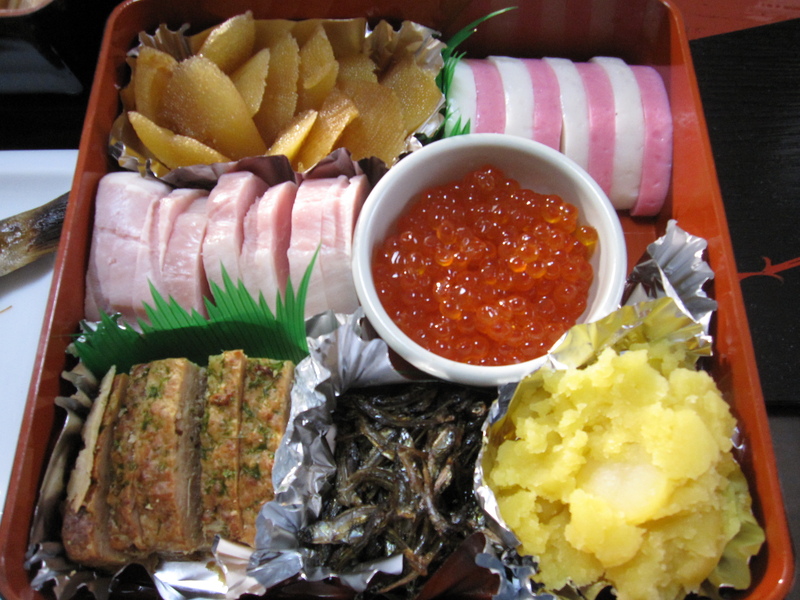 You can buy oden sets at any Japanese market and some Asian markets. 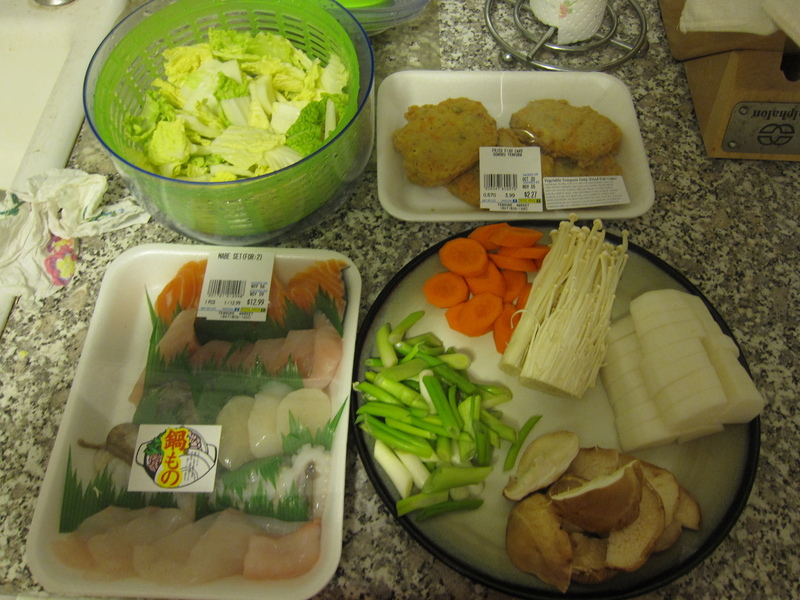 We got two two-person sets that were on sale from Mitsuwa, each containing a variety of fish cakes. 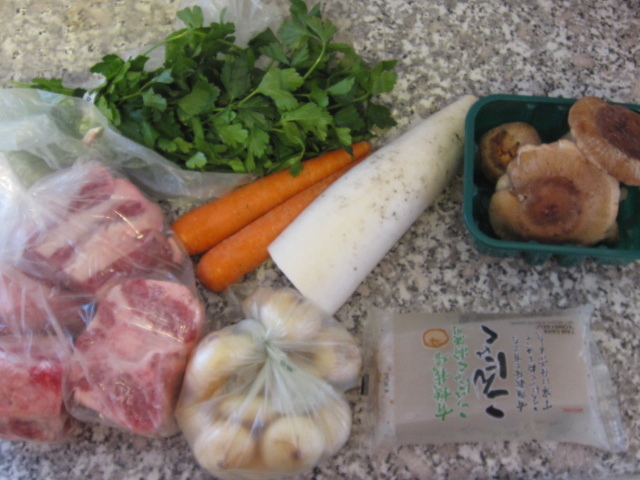 Some with carrot in them, some with burdock root, some grilled, most deep fried. 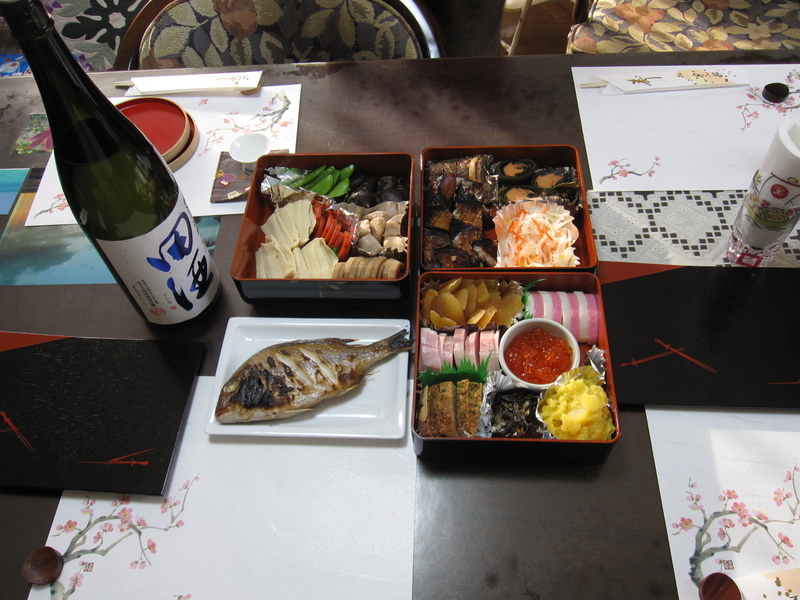 We also had a package of chikuwa fishcakes that we used. 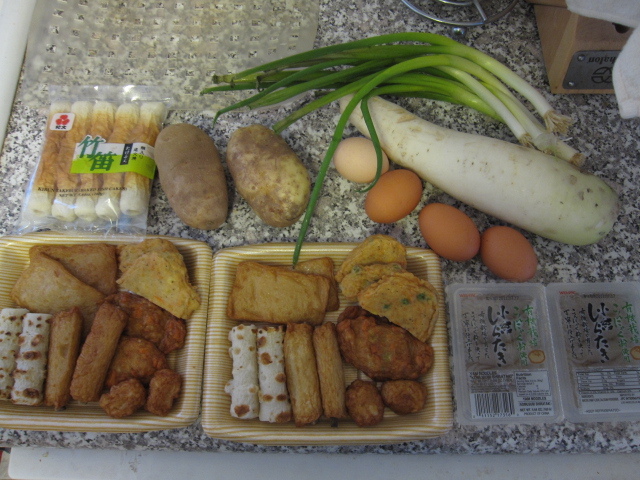 I skinned and chopped two russet potatoes, medium boiled 4 eggs (just enough to peel the shell off, since they were going to simmer in the dashi for a while I didn’t want to overcook the yolk too much), 1 daikon skinned and chopped, a bunch of green onions chopped, and a couple packaged of shirataki konnyaku. 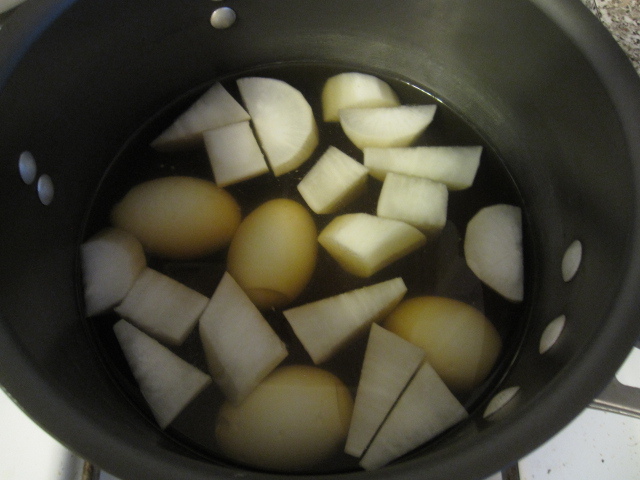 Once the dashi was ready I added the eggs and daikon and simmered them, covered, over a low heat for an hour. 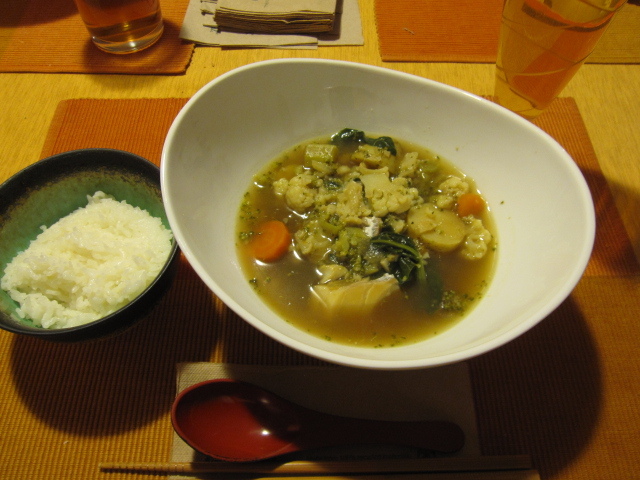 This allows both to absorb a lot of the dashi flavor. 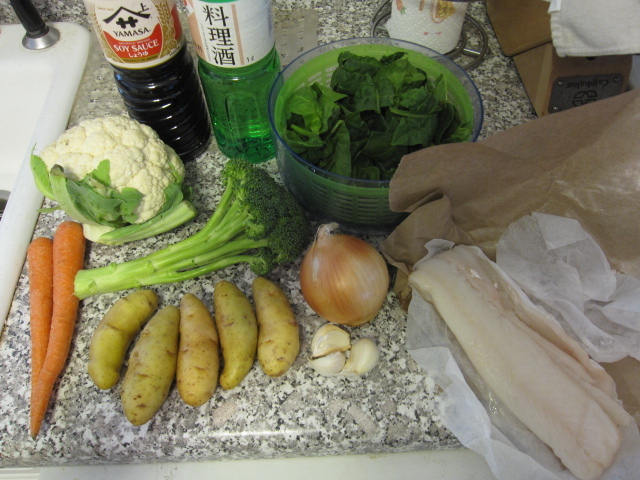 Then I added the potatoes and konnyaku. 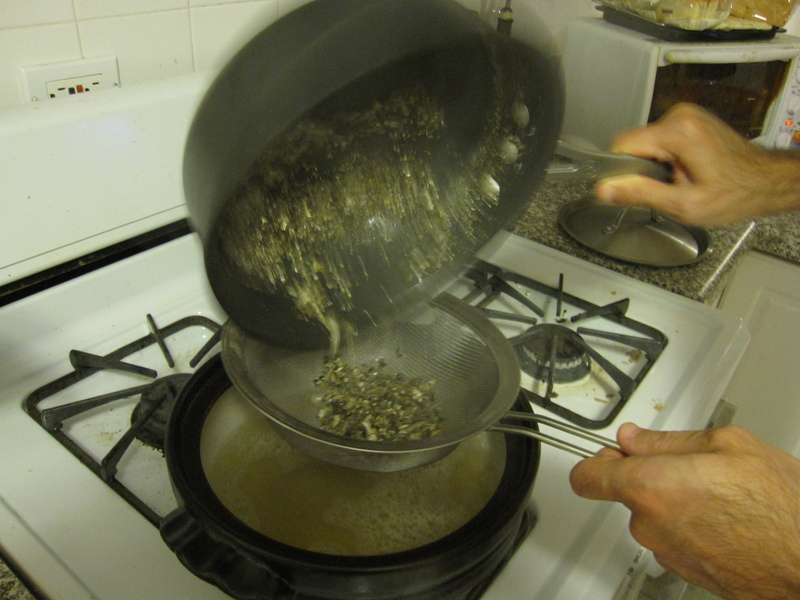 If you boil the potatoes too long they will fall apart and melt into the broth. I only let them simmer for about 20 minutes. 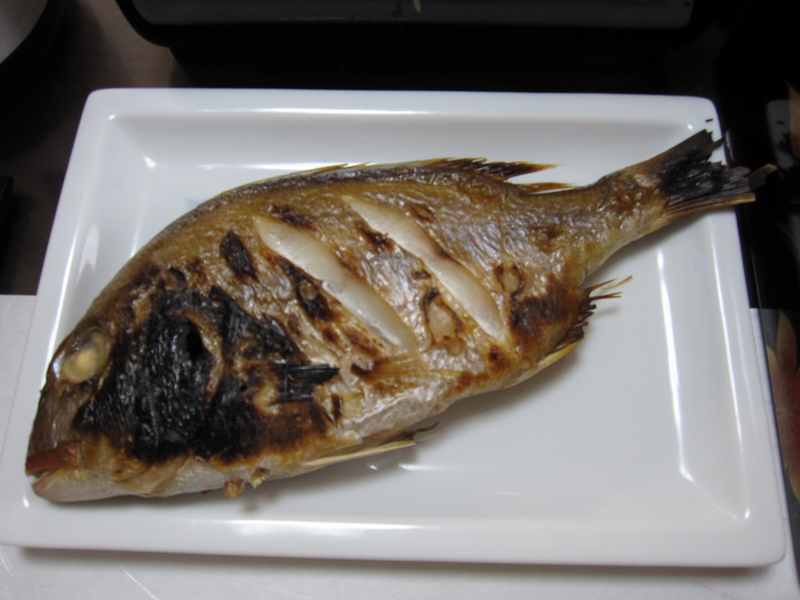 That’s also enough time for the konnyaku to take on some flavor. If you’re using sliced blocks of konnyaku instead of the shirataki noodles you’ll need to add them about 20 minutes earlier. Since most of the fishcakes are deep fried before packaging they can sometimes have a little bit of grease residue. 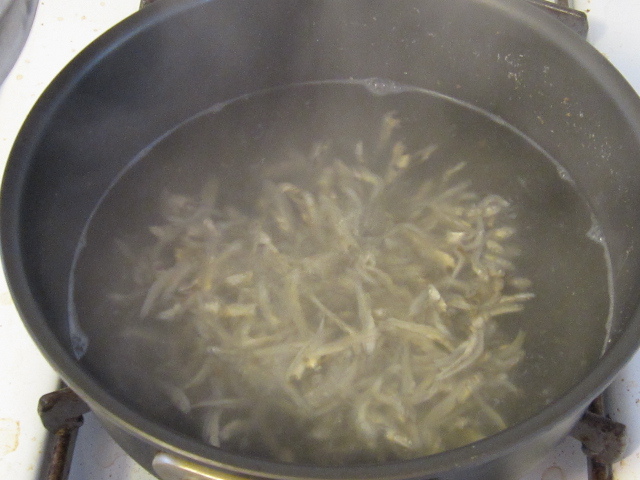 Because of that I boil and drain them seperately for a few minutes before adding them to the dashi, that gets rid of any unwanted oil. They also are fully cooked so just need to be heated up. 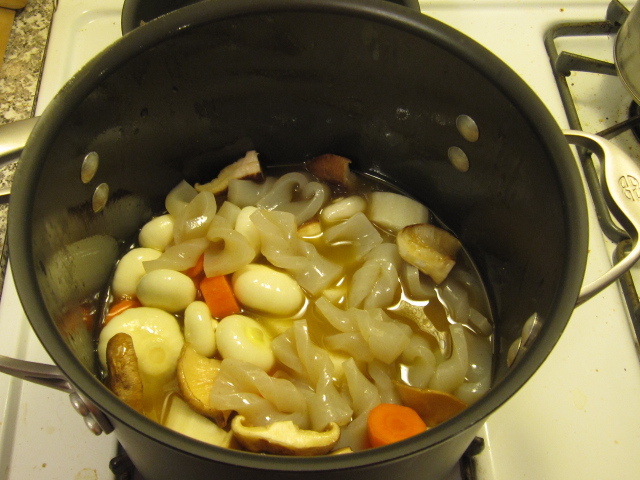 After about 5 minutes in the dashi, along with the green onions, the oden is ready to go. 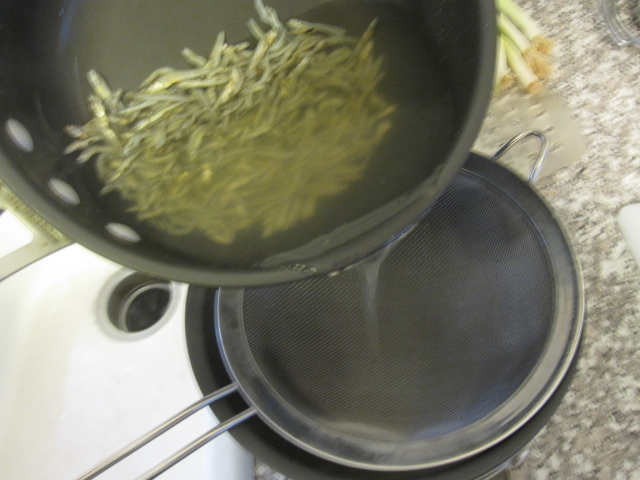 To serve it up I divied one of each for both of our bowls and then laddles some dashi on top. 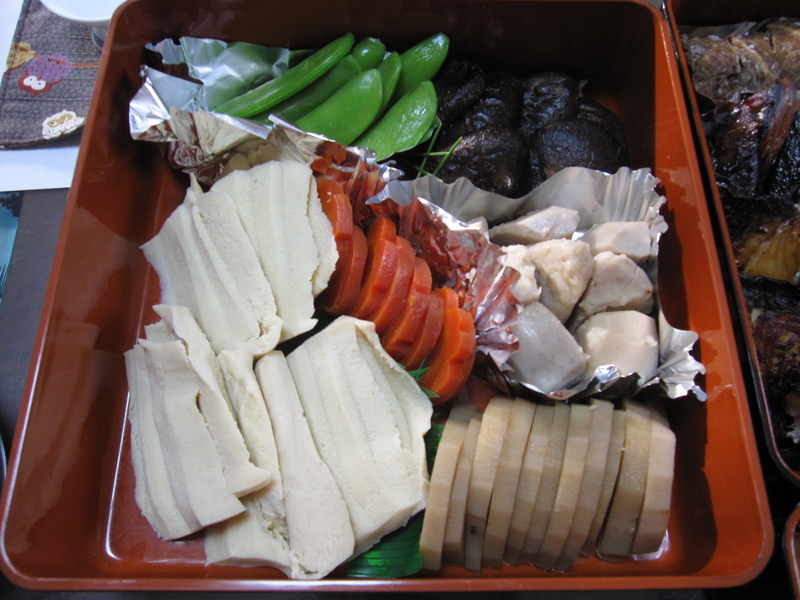 Oden is great with a cold beer and some white rice, I covered our rice with ground sesame seeds. 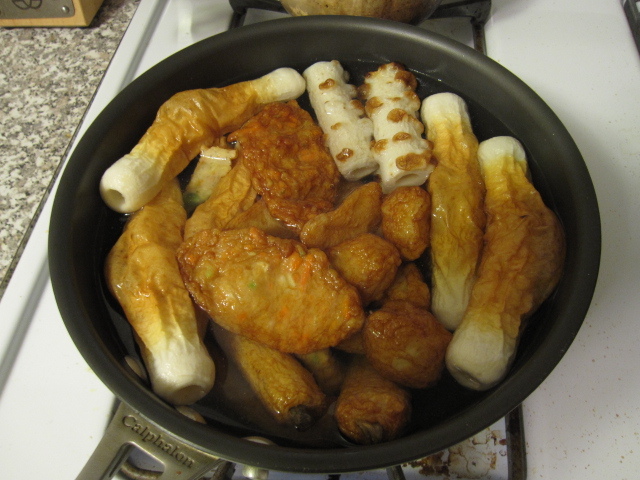 I tell you though, oden is even better the next day. 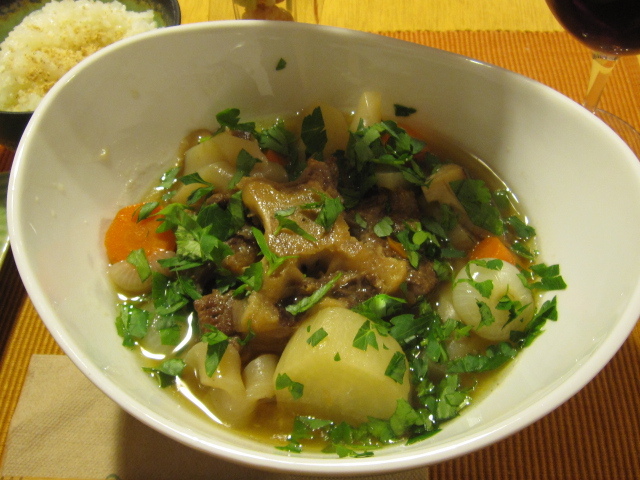 It is a stew, so once all of the flavors fully penetrate the ingredients you really have a special dish here. The daikon and egg for lunch today were outstanding! It’s starting to get damn cold here in Chicago. 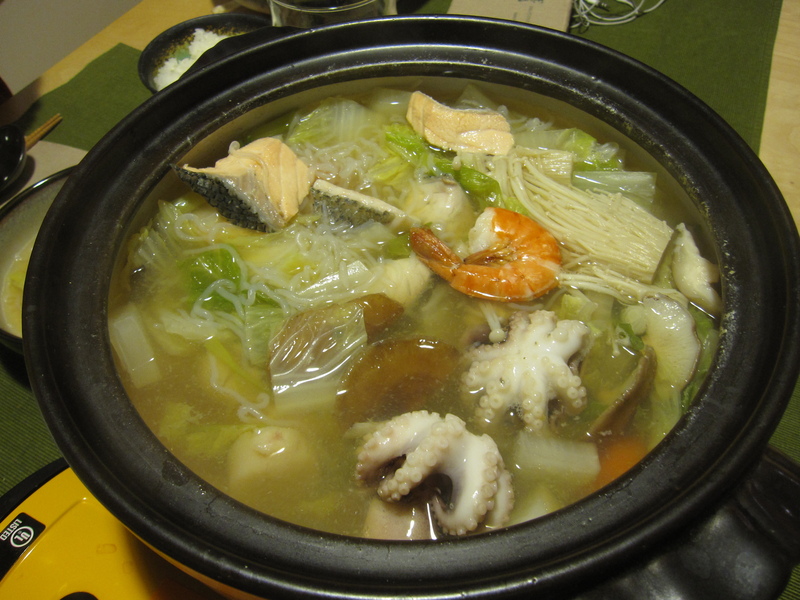 In Japan, when it gets cold out, they start eating Shabu-shabu which is a Japanese hotpot. It’s called Shabu-shabu because of the sound the thinly sliced meat makes when you slosh it around in the broth to cook. I didn’t make this one, this dish is one of my wife’s responsibilities. To start, she had to make the broth. 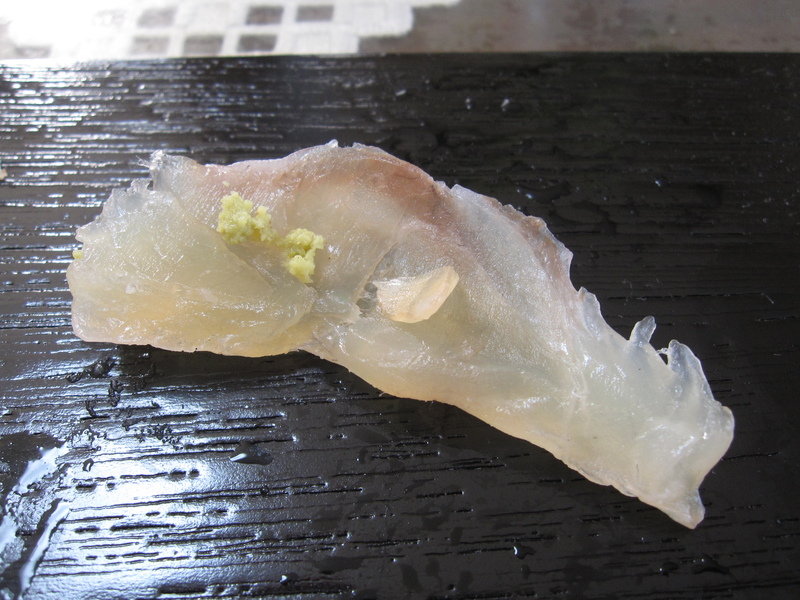 Typically it’s Konbu (kelp) boiled in water. 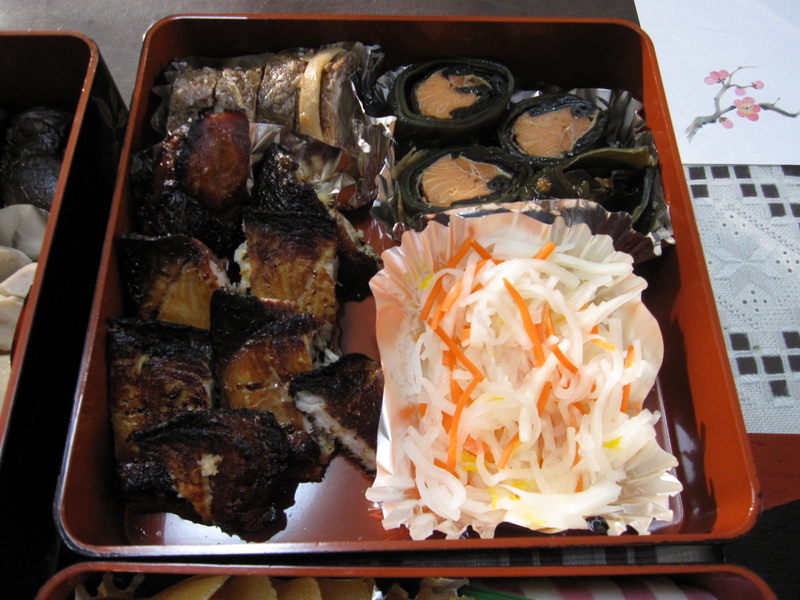 We didn’t have any Konbu, so she used Niboshi, dried anchovies. 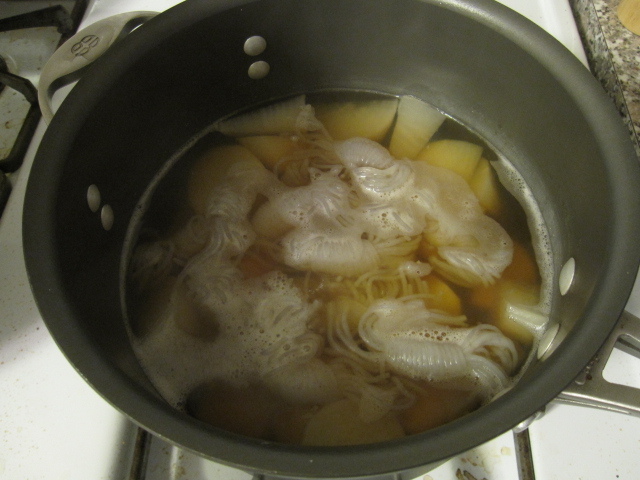 A good handful boiled in water for a bit and you get a really nice healthy broth. 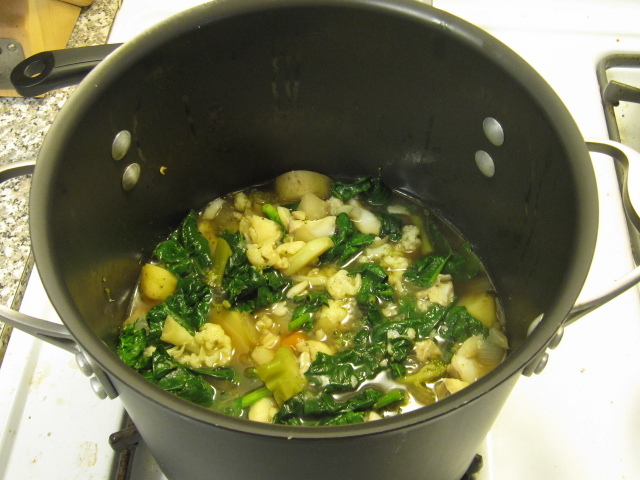 To the broth she added shiitake and enoki mushrooms, green onion, and shanghai cabbage. 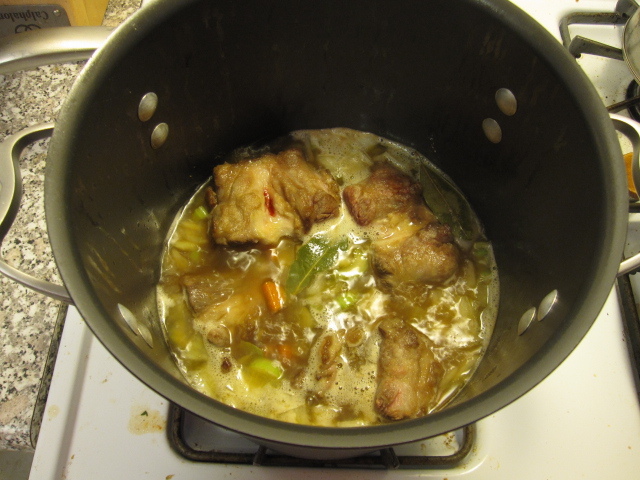 That was left to cook for about 10 minutes in the boiling broth. If I hadn’t forgotten carrots at the store she would have added them as well. 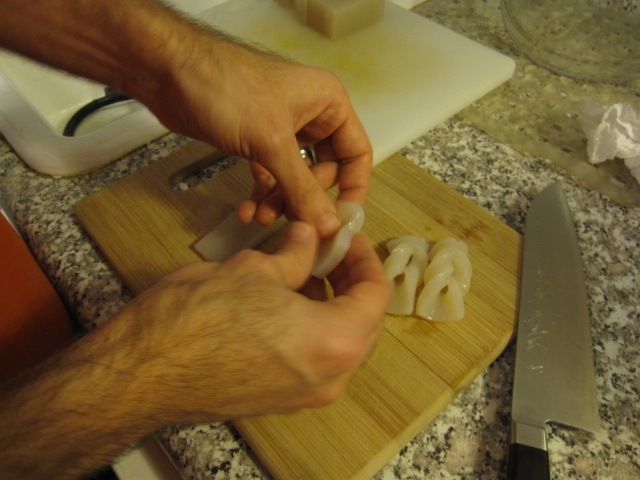 Daikon also makes regular appearances in Shabu-shabu. After the veggies cooked a little she added tofu and konnyaku, a firm gelatinous cake-like ingredient made from yam starch. 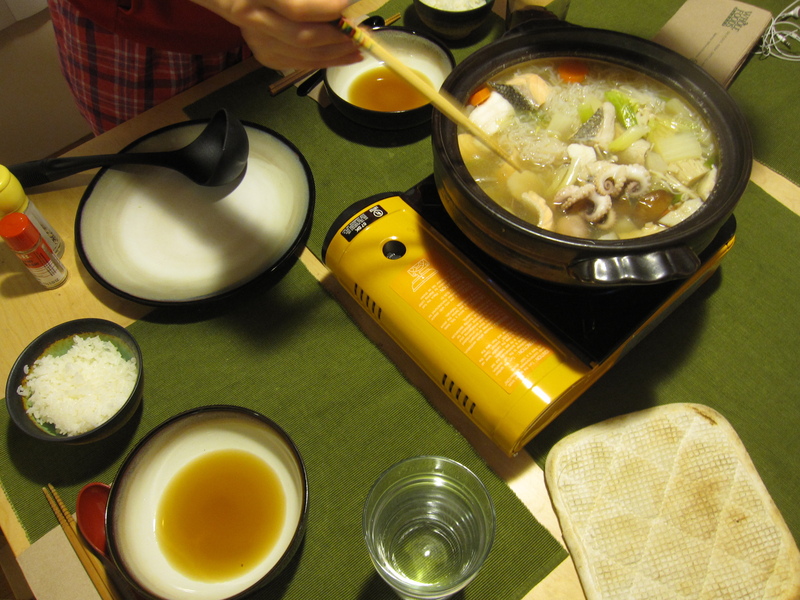 Then the pot was brought to the table and left to simmer on our table-top propane burner (something every Japanese household has). 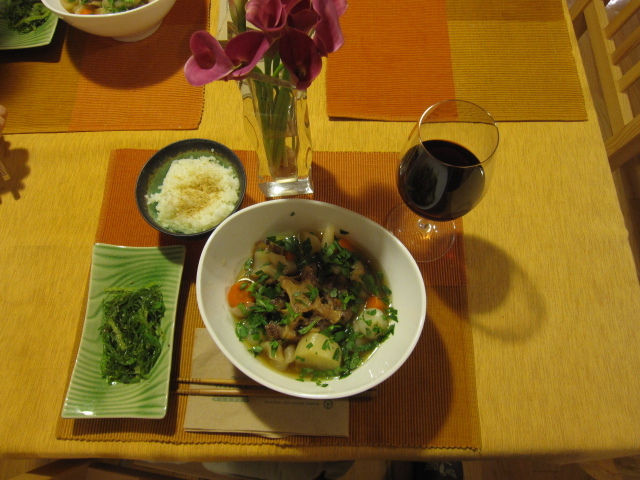 In our bowls we poured a little ponzu, a soy sauce product with yuzu citrus juice and a little vinegar mixed in, and a couple ladles of the broth. Then we picked and chose which veggies we wanted and dipped them in our bowls before eating. All the while taking slices of the pork (we picked up some thinly sliced kurobuta pork at Mitsuwa) and sloshing them around the broth to cook. A side of white rice to complete the chow. This a the perfect winter dish to have with a cold beer. It’s fun, delicious, and very healthy since there are no added oils or anything. 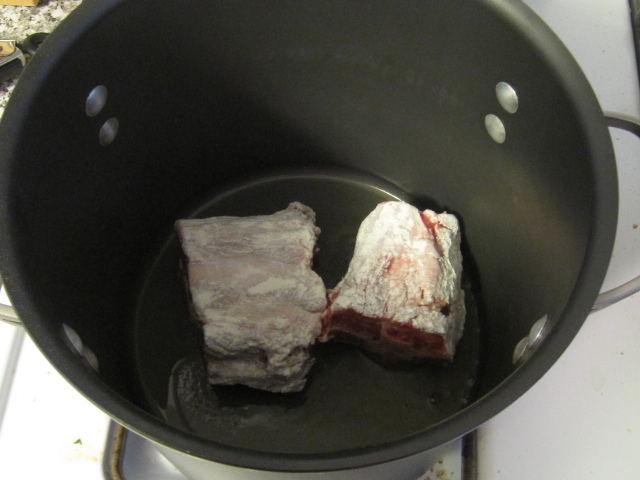 Just make sure your meat, whether using pork or beef, is very thinly sliced so that it cooks quickly in the broth.